I recently attended the 15th annual Durham Blackboard Users’ Conference. This is organised and held at Durham University in the first week of January every year. 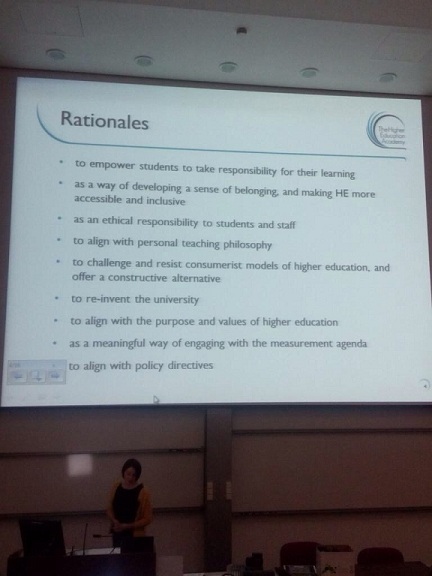 The theme for this year’s conference was ‘Students as Partners’. As usual there was a range of different workshops and presentations to attend hosted by Blackboard users from all over Great Britain. Presenters demonstrated how they had involved students as partners – such as developing an Open Badges scheme for Student Reps; designing a student-centred default view for Blackboard; using ‘clickers’ (voting systems) to engage students in their learning in class and in lectures. The representative from Blackboard demonstrated how they encourage students as partners with various Blackboard features such as ‘Achievements’ (Blackboard’s version of ‘Open Badges’), enabling students as ‘change agents’ via the Blackboard mobile app, student-led awards for good Blackboard courses, and the use of Blackboard analytics to enhance the student experience. Although, as is often the case with the corporate presentation some of it felt a bit ‘shoe-horned’ into the theme. Abbi made the point that ‘partnership’ and ‘engagement’ are both contested and vague terms that are subject to misunderstanding and misinterpretation. 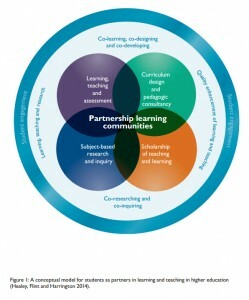 For example ‘partnership’ could be seen to reflect a consumerist approach to learning as part of a ‘market discourse’ in Higher Education. However, she felt that the ambiguity of the word ‘partnership’ was positive in that it allows flexibility which reflects the different ideas about it. Learning, teaching and assessment – active and collaborative learning, personalised learning, peer education. Subject based research and enquiry – embedding research and enquiry-based learning e.g. the ‘Student as Producer’. Scholarship of teaching and learning – an exploration of how students learn. Curriculum design and pedagogical consultancy – consulting students about the design of curriculum, not just asked to evaluate it. They tend to be surveyed rather than seen as partners. 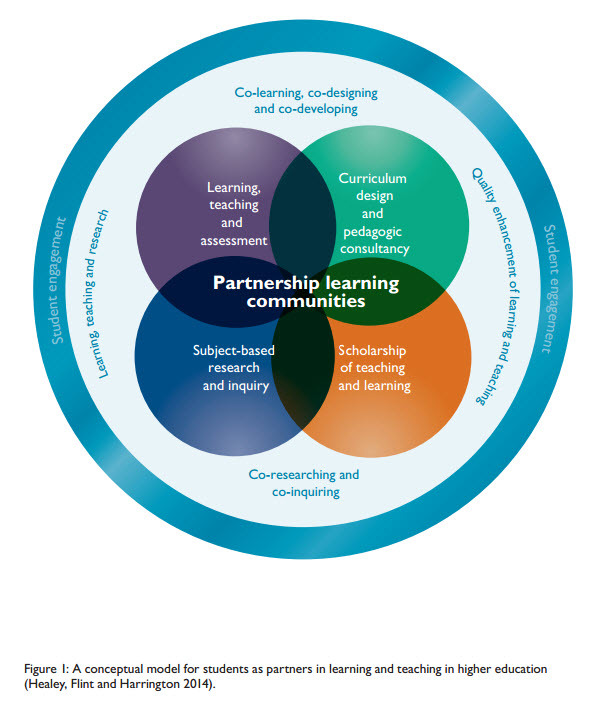 The idea behind this framework is that it isn’t meant to be prescriptive, but rather it allows institutions to think about how students can be involved and how partnerships can be developed between staff and students. One of the difficulties with the concept of Students as Partners is that in the current market-oriented universities, it may be the case that students see themselves as customers, who want knowledge passed on to them by experts, so they can collect their qualification at the end of three years. There is also an issue of academic staff having to give up a degree of control. However, it could be argued that they have to do this anyway – the idea of the ‘sage on the stage’ is no longer relevant – students have access to all the information and knowledge they want on the web – there are MOOCS where they can be ‘taught’ by top professors from the world’s elite institutions. So the role of the academic becomes more one of using their expertise to ensure that students are looking at the right information, and can be discerning and critical about what they are learning. So there are real challenges to the idea of ‘Students as Partners’, but if it’s done properly, and in the right spirit it can lead to a better learning experience for staff and students alike. 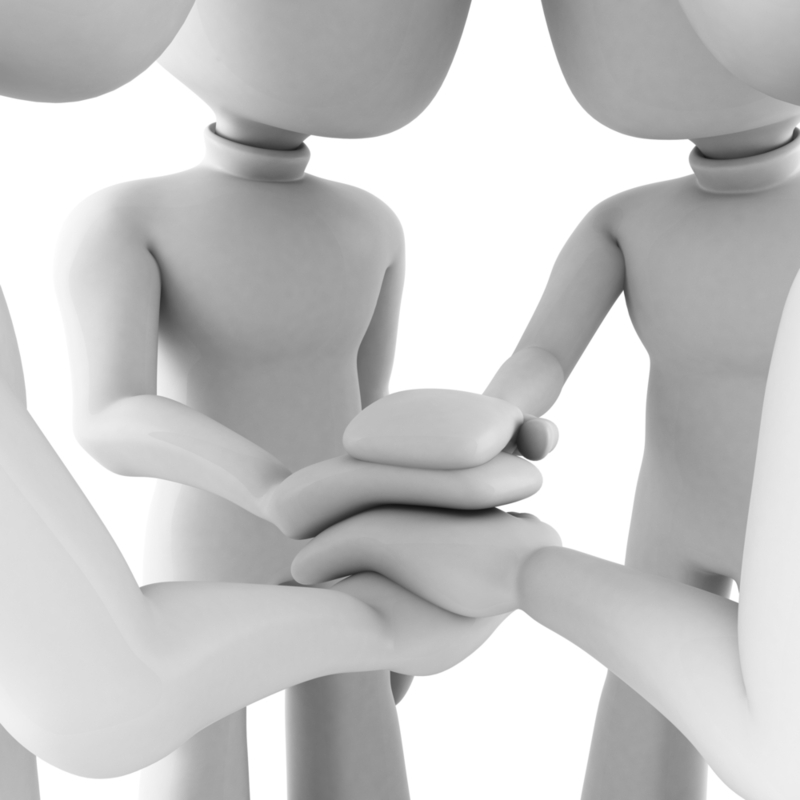 The HEA Engagement Through Partnership Framework is a valuable tool for policy making and strategic change.